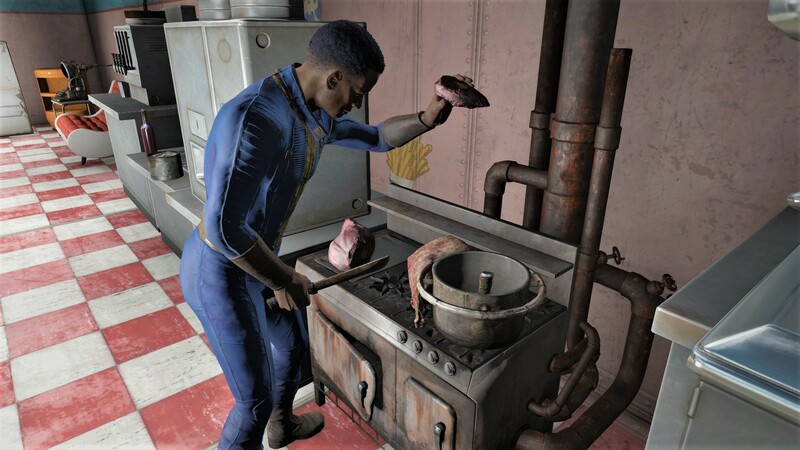 One wouldn’t claim Vault 88 has the best in kitchen appliances, but then again, the wasteland does not offer clean new stoves. Hygiene and germ theory aside, Girolamo makes a mean beef stroganoff. He’s hacking, and whacking, and smacking! Just to get you the meanest beef in the wasteland. PS: “Dweller” seems weird written with a capital D for some reason. Rumor has it around 50% of all people in the wasteland love the capital D.
It really is crazy. I assume it has something to do with their obviously odd sense of humor and love of simply saying capital D in random conversations.